Today is Midsummer's Eve, possibly the biggest holiday in Sweden. (At least after Christmas.) It's celebrated with friends and family, and lots of food. Anyway. Some people drink a lot, but we're not really those people. (Anymore.) We eat strawberries, though, like everyone else in Sweden. That's definitely a must, and I like to turn them into this beautiful strawberry cream cake. It's not complicated, but do plan ahead and read through the entire recipe. It's best to assemble the cake, without decorations, the day before and wrap in plastic. Preheat the oven to 200°C. Butter and line a 24 cm springform cake pan. Beat the eggs and the sugar until very very fluffy. (Carefully fold in the flour. Pour into your prepared pan, and bake for 15-20 minutes. It should look golden brown and have started to shrink away from the edges. Use a cake tester to check for doneness. Take it out of the oven, release from the pan, place on a rack and place the springform inverted on top while it cools. Score the vanilla bean and scrape out the seeds into a saucepan. Add the milk – and the bean – and bring to a boil. Remove from heat, and let the milk infuse for ten minutes. (Put a lid on top.) Meanwhile, mix the egg yolks with cornstarch and sugar. When the milk is done, remove the vanilla bean, and pour the hot milk over the egg mixture. Mix well, and pour back into the saucepan. Bring to a boil, stirring CONSTANTLY. It will thicken a lot all of a sudden. Remove from heat, and quickly beat in the butter. Move to a clean container. Cool quickly, and let it sit for at least 3-4 hours in the fridge. After that, whisk it really well so it becomes smooth and silky. Purée half of the strawberries, about 250 g. Slice the rest. Cut the cake in three layers. Spread first layer with half of the strawberry puree, and then with half of the vanilla custard. Top with the second layer, and spread with the remaining fillings. Finish with top layer of cake. Place on your cake platter. Use a little cream to smooth out the top of the cake. Transfer the rest of your whipped cream to a piping bag fitted with a large open star nozzle. Pipe straight up along the edge, finishing with a small star on top of the cake. Repeat all around. You’ll have JUST enough cream, so pipe carefully! 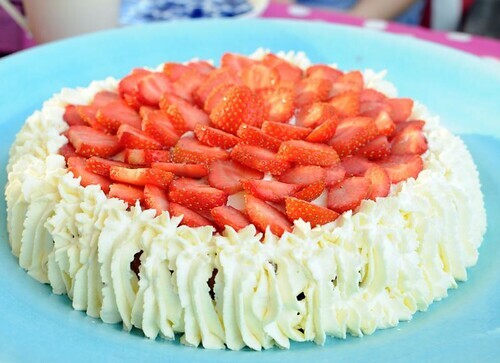 Decorate with the strawberries. I like to leave one whole in the middle, and place the cut berries as petals all around it. I did the cake yesterday and it is AWSOME! Thank you for sharing wonderful recipes!